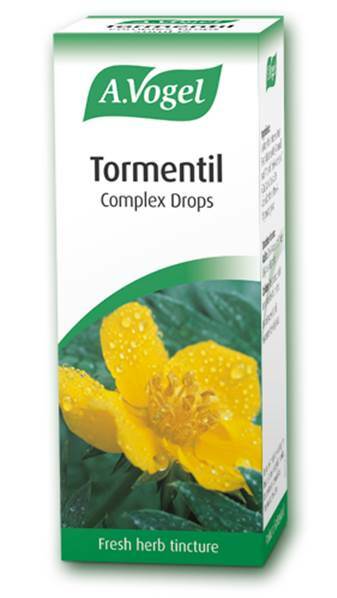 A.Vogel Tormentil Complex - 50ml. A.Vogel Tormentil Complex may have the following benefits may help symptoms of Diarrhoea, Irritable Bowel Syndrome (IBS) with diarrhoea, Diverticulitis, Colitis, Crohn's Disease and Traveller's tummy. Diarrhoea is the body's attempt to expel an irritant from the bowel. Infection and food poisoning cause inflammation in the gastrointestinal tract, resulting in diarrhoea and vomiting. A number of antibiotics can upset the balance of the natural flora of the gut giving rise to diarrhoea. It may also be a symptom of colitis, Crohn's Disease and IBS. Stress may be a significant factor causing over stimulation of the bowel, while chronic diarrhoea may be a sign of food allergy, often related to dairy products or wheat. Tannins exert an 'astringent' action on the bowel. This helps to relieve inflammatory bowel conditions and reduce the frequency and severity of loose motions. Tormentil has a high tannin content (10% to 30%) which is responsible for its astringent action on the digestive tract. Tannins bind to the proteins present in the mucous membranes, producing a coat on the membrane surface which protects the exposed tissues from irritation. This has the ability to form a barrier against most infective organisms and many toxins, slowing down the frequency of bowel movements and encouraging the healing of the affected bowel. Avena sativa enhances the action of the remedy by exerting a mild sedative and restorative effect on the nervous system, which also calms an overreactive digestive system. This is particularly relevant in the condition of IBS. Note: The alcohol can easily be burnt off if desired, by placing the required drops in a glass of hot water and leaving for 5-10 minutes before ingesting. Potentilla tormentilla (Tormentil) 75g and Avena sativa (Oats) 25g. Alcohol content approx. 62%). Adults: 20 to 30 drops 2 to 3 times a day, in a little water. Children: 1 drop for each year of age (2-12 years), in a little water. Children with diarrhoea must consult a Healthcare Professional. This is dependent on the underlying cause of the problem. No restrictions to long term use.